I'm not (too) ashamed to admit to being a sci-fi geek and, in particular, Star Trek. On my current assignment, I've had a few rental cars with a Ford Fusion (a Mondeo in the UK) being the latest. With a large touchscreen, running "SYNC by Microsoft", the MyFord Touch software is generally regarded as pretty poor with a litany of upgrades breaking or removing functionality, and long promised items - such as the "AppLink" available on the non-Touch system - being undelivered. 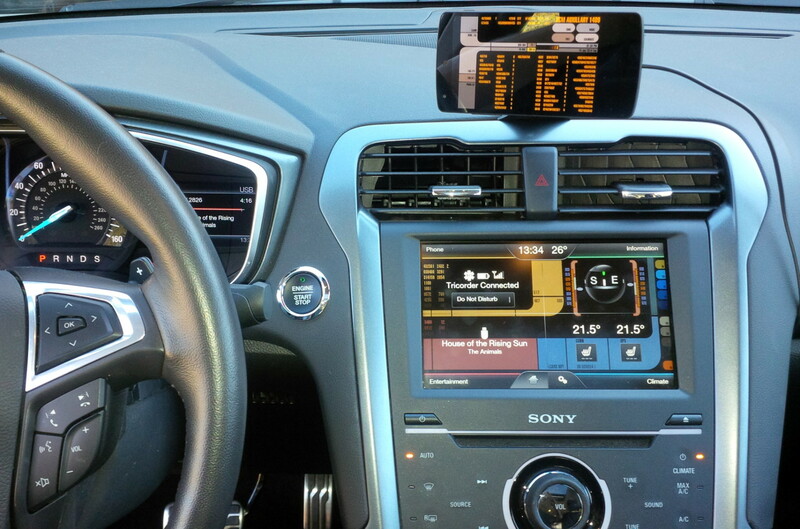 The phone is mounted using a Mountek nGroove Snap and Google Nexus charger, and is running 6 LCARS (available for both Android and iOS) in this screenshot, though it tends to be running Ulysses Speedometer and Google Maps when actually moving. Following on from this - for the benefit of Google - the 2015 Lexus IS 250 (and presumably, 350) with the non-nav (non-navigation) Lexus Display Audio (LDA) has a 7" display with a resolution of 800x480. Much experimentation with different sized image grids to find that!